On April 28, 2015, Russia launched the unmanned Progress 59 cargo ship on a one-day delivery flight to the International Space Station, only to see the mission fail when the Progress spacecraft suffered a fatal malfunction in orbit. See photos from the doomed cargo mission in this Space.com gallery. This image is a still from a video camera aboard Russia's Progress 59 cargo ship that showed the vehicle clearly spinning in orbit on April 28, 2015, shortly after its launch. Russian engineers are working to regain control of the unmanned spacecraft. 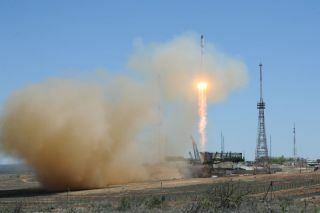 A Soyuz rocket launches the unmanned Progress 59 cargo ship from Baikonur Cosmodrome, Kazakhstan on April 28, 2015 on a mission to deliver supplies to the International Space Station. Progress 59 reached orbit, but then malfunctioned. A Soyuz-2.1a rocket begins to launch cargo spacecraft Progress M-27M from the launch pad at the Baikonur launch site in Kazakhstan on April 28, 2015. Launch vehicle Soyuz-2.1a carrying cargo spacecraft Progress M-27M stands on the launch pad at the Baikonur launch site in Kazahkstan ahead of liftoff on April 28, 2015. Launch vehicle Soyuz-2.1a carrying cargo spacecraft Progress M-27M stands on the launch pad at the Baikonur launch site in Kazakhstan ahead of liftoff on April 28, 2015. Painted on the payload fairing of Soyuz-2.1a carrying the Progress 59M (M-27M) spacecraft is a streaming St. George Ribbon, a picture of the Order of Glory with a laurel wreath and an inscription reading "70 years," referring to the 70th anniversary of end of the 2nd World War. A Soyuz-2.1a rocket carrying cargo spacecraft Progress M-27M stands on the launch pad at the Baikonur launch site in Kazakhstan ahead of liftoff on April 28, 2015. A Soyuz-2.1a rocket carrying cargo spacecraft Progress M-27M stands on the launch pad at the Baikonur launch site in Kazakhstan ahead of liftoff on April 28, 2015. The support arms are in the lowered position.